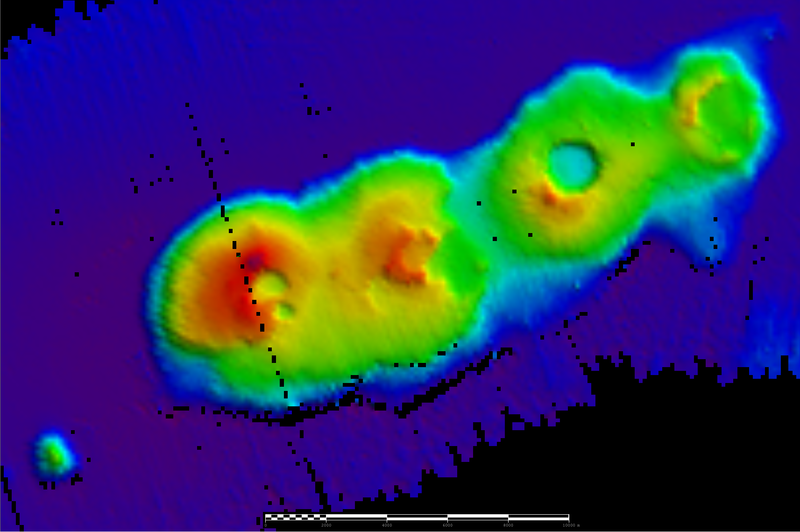 Australia’s new ocean-going research vessel Investigator has discovered extinct volcanoes likely to be 50 million years old, about 250 km off the coast of Sydney in 4,900 m of water. The chief scientist for the voyage, UNSW marine biologist Professor Iain Suthers, said while we searching for the nursery grounds for larval lobsters, the ship was also routinely mapping the seafloor when the volcanoes were discovered. “The voyage was enormously successful, not only did we discover a cluster of volcanoes on Sydney’s doorstep, we were amazed to find that an eddy off Sydney was a hotspot for lobster larvae at a time of the year when we were not expecting them,” Professor Suthers said. The four extinct volcanoes in the cluster are calderas, which form after a volcano erupts and the land around them collapses, forming a crater. The largest is 1.5 km across the rim and it rises 700 m from the sea floor. Professor Richard Arculus from the Australian National University, an igneous petrologist and a world-leading expert on volcanoes said these particular types of volcanoes are really important to geoscientists, because they’re like windows into the seafloor. “They tell us part of the story of how New Zealand and Australia separated around 40-80 million years ago and they’ll now help scientists target future exploration of the sea floor to unlock the secrets of the Earth’s crust,’ Professor Arculus said. “They haven’t been found before now, because the sonar on the previous Marine National Facility (MNF) research vessel, Southern Surveyor, could only map the sea floor to 3,000 m, which left half of Australia’s ocean territory out of reach,” Professor Arculus said. “On board the new MNF vessel, Investigator, we have sonar that can map the sea floor to any depth, so all of Australia’s vast ocean territory, is now within reach and that is enormously exciting,” Professor Arculus said. Professor Suthers said the 94 m Investigator has capabilities that marine scientists in Australia have never had before and it will be key to unlocking the secrets the oceans around our continent and beyond. “Investigator is able to send and receive data while we’re at sea, which meant the team back on base at UNSW in Sydney could analyse the information we were collecting at sea and send back their analysis, along with satellite imagery, so we could chase the eddies as they formed,” Professor Suthers said. “This is the first time we’ve been able to respond directly to the changing dynamics of the ocean, and for a biological oceanographer like me, it doesn’t get more thrilling,” Professor Suthers said. The research voyage led by Professor Iain Suthers departed Brisbane on 3 June and concluded on 18 June in Sydney, with 28 scientists from UNSW, Latrobe University, the University of British Columbia, the University of Sydney, the University of Auckland, the University of Technology Sydney and Southern Cross University. The centre of the volcanic cluster is 33 31 S, 153 52 E, which is 248 km from Sydney Heads. The cluster is 20 km long and six km wide and the seafloor 4890 metres deep, with the highest point in the cluster rising up to 3998 metres. RV Investigator is a 94 metre purpose-built research vessel, capable of travelling 10,000 nm in a single voyage, accommodating up to 40 scientists and support staff, from the equator to the Antarctic ice-edge. The $120 million ship was commissioned into operation in December 2014 by the Minister for Industry and Science, Ian Macfarlane, and supports atmospheric, oceanographic, biological and geoscience research. The Marine National Facility is a blue-water research capability, funded by the Australian Government and managed by CSIRO on behalf of the nation. It is available to all Australian scientists and their international collaborators, with access granted on the basis of proposals that are internationally peer reviewed, and independently assessed for science quality and contribution to the national interest. Hi. Field trips with Newcastle University, based off classic book “The Geology of the Hunter Valley” by Beryl Nashar, took us to the shoreline off the sothern side of Lake Macquarie’s entrance below Swansea head. There exposed on the rock shelf were fossilised tree ferns all snapped off at ankle height in a layer of chert. Nearly all of the stumps were inclined from the same direction as well as all the snapped off poles, now jasperised in the volcanic ash. The object of the lesson was to look at the common angle of inclination and surmise that somewhere out in the Tasman somthing went bang. In fact bang many times, some of the beds of cherts show dozens of events in short succession then long dormancy. In fact half of the many seams in the Newcastle coal measures were buried below these blasts, so the confirmation of these features are great, but the field trip in Beryl’s 1960ish book already proved they were there.